Pool customers must meet certain criteria in order to be compliant with local building codes. Pool code styles are available. Keep in mind not all 4' high aluminum fences meet pool code. In most cases the aluminum fence must have a minimum of 45" spacing between the two rails closest to the ground since the most common styles have a 4" picket spacing. One style is available in 4" high (Ovation), yet other pool styles come in 54" (Modified 200 and 202) and 57" (Modified 101 and 111 with finials) high depending on the style. All styles available in black, white, or bronze. All sections come standard with an External Flat Post Cap. Ball post caps are available at an additional charge. Aluminum fences are installed in concrete footers 2 1/2' to 3' deep. Gates match the style fence you choose. 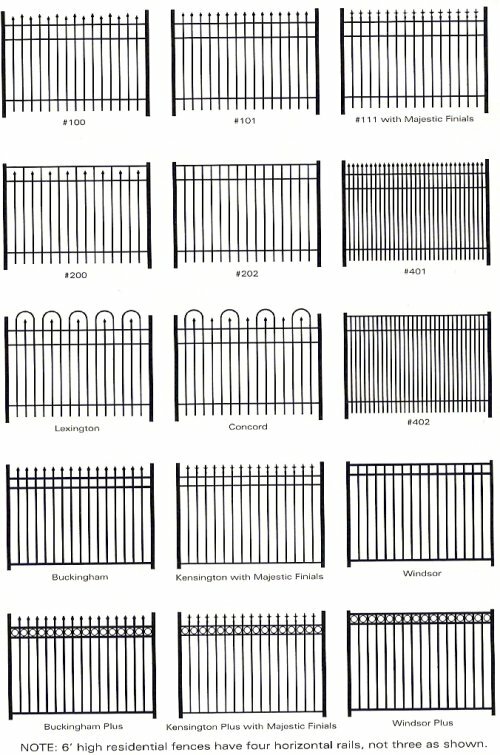 Heavier wall gate posts are used with each gate. Decorate arch top gates are available at an additional charge. Aluminum fence sections are 6' long. Fences are installed 2" off the ground to meet code and to compensate for any ground movements/shifting that can occur (especially during the winter months). Be sure to obtain a building permit, if required.